Titanium metal production by the Kroll process requires a high-grade ore material as a feedstock for chlorination, such as natural or synthetic rutile. Electrochemical methods for making titanium have generally required even higher purity. 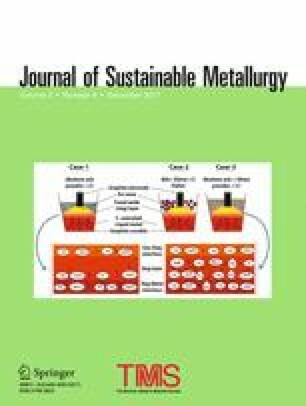 This paper describes different methods for iron removal from a pseudorutile mineral sand for the eventual goal of producing commercially pure titanium powder by the MER electrochemical process. One method involves the dissolution of the Fe\(_2\)O\(_3\) content of the ore in an alkali chloride molten salt, followed by plating to remove the dissolved species as metallic iron. The other method described involves the reduction of the ore to titanium oxycarbide, which also reduces iron and some other metal oxides present to metallic form. This reduced material is used as an anode in an electrochemical cell, and the metallic impurities are selectively removed by careful control of the anode potential. The products of both processes are compared with respect to their impurity contents, and their potential applications to different titanium production methods are also examined.